Start by making the sweet and spicy seeds. Place a large frying pan on a moderate heat and add the pumpkin seeds, sunflower seeds, and pine nuts. Toast gently for 5 minutes, stirring often, until they turn golden. Add the sesame seeds (or chia seeds if using) and continue toasting for 2 more minutes. Stir constantly. Add the honey and TABASCO® Sauce. Stir well for 2 minutes. Add the sea salt and the paprika. Stir for a final 1-2 minutes, until the base of the frying pan looks dry again and the moisture from the honey and TABASCO® Sauce has evaporated. Tip the seeds onto parchment paper and spread them out evenly to cool. Halve, de-stone and chop the avocado into small chunks, quarter the cherry tomatoes, finely slice the scallions, and finely chop the cilantro. Place these in a bowl and mix with the olive oil, some salt and pepper, and the juice of half a lemon. Divide the watercress between 4 shallow bowls and add some of the avocado and tomato salad to each. Whisk the eggs in a separate mixing bowl, seasoning well with salt and pepper. Place a large non-stick saucepan or frying pan on a medium heat and add the butter. Just as the butter starts to melt, add the whisked eggs. Stir gently. Once the eggs are cooked to your liking divide between the 4 bowls. To serve, drizzle over olive oil and a squeeze of lemon, then top the brunch bowls with the sweet and spicy seeds. 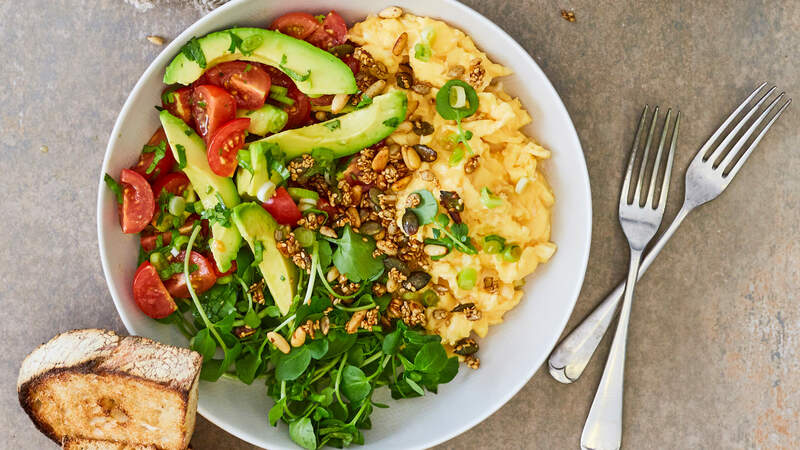 If you’re putting on a brunch spread for a group of friends, try topping the bowls with crumbled feta cheese and serve with toasted sourdough bread on the side. Or, use a dairy-free butter alternative to make this recipe lactose-free. Feel free to use elements of this recipe independently – the sweet and spicy seeds can be added to almost any dish to add flavor and texture.